★ WEATHER RESISTANT RUNNING GEAR - Waterproof washable neoprene material with special-shaped waterproof zipper that prevents ingress of water. So that you will not need never worry about the content you have in your running fanny pack pockets get's wet. 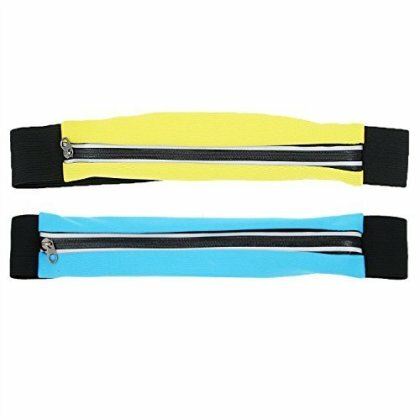 ★ FASHIONABLE & ULTIMATE COMFORT - Perfectly complements modern workout gear, super reflective stripes for safety, adjustable waist band & expandable pocket are designed to provide extra stability so it won't ride up, bounce or chafe during long runs, exercise or intense workouts! ★AMPLE STORAGE SPACE - Offers the best compromise between slim, ergonomic design and roomy storage for everything you need; Ultra-flex elastic pocket stretches to accommodate any smart phone (even with the case), credit cards, keys, wallet. ★MONEY BACK WARRANTY - No questions asked! If you're not happy, just return your Running Belt for a full refund!